Quite a famous photo, actually. 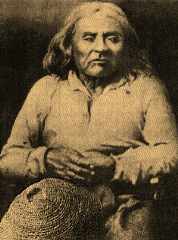 Chief Seatlh, photographed sometime before his death in 1866. He holds a traditional northwest coast basketry hat on his lap. Though Dr. Henry Smith -- who transcribed the real version of Sealth's 1854 Funeral Oration -- thought him a large fine-looking fellow, Jeffers preferred to model her pix on Cheyenne warrior Two Moons, who better fits her stereotypes of "Indian". Of course the Cheyenne and Lakota horse warriors of the Plains had little in common with the Northwest Coastal Suquamish-Duwamish people, didn't resemble them physically, didn't dress like them. Note about names: the most frequent spelling of his name is that of the city named after him: Seattle. This doesn't reproduce the "fricative ending" of his name, which is sometims rendered as I've chosen to, somtimes as Seatlh, Seathl, See-yat. He was baptized Noah when he was 45 years old, converted to Catholic Christianity. He was born in 1788 to Scholitza (Duwamish mother) and Schwabe (Suquamish) father near the present area of the small Suquamish reservation in Washington State. The Salishans wer mostly patrilineal; he grew up speaking his father's Suquamish dialect, and inherited the principal chieftainship of both Suquamish and Duwamish Nations. Sealth counseled friendship and free trade with the many white settlers that were pouring into Oregon territory (and what's now Washington state). The whites at Puget sound settlement took his name -- as they rendered it -- to name their settlement. But Salishan custom (found in many other tribal cultures) held that to say the name of a dead person -- especially if often said -- would disturb the spirit's passage on. In order to use their form of his name -- Seattle -- for their new city, settlers agreed to compensate Sealth (while he was still alive) for the bother his spirit would later experience after death. A small tax was imposed on the non-Indian residents for this purpose. The famous speech -- a funeral oration for his people -- which has been repeatedly altered into the trendy web-of-life ecology-preview version used in Jeffer's children's book, was not made at the signing of the Port Elliot Treaty of 1855; Dr. Smith, whose published notes are as close as we can come to the original, was not present there. The address is an earlier one, of 1854, a speech delivered to the Washington territorial governor. Dr. Smith published his notes in 1887, 20 years after Sealth had died. The original Smith notes have been lost. The newspaper publication is thus the closest anyone can come to what Seralth actually said. The treaty of 1855 (Port Elliot) was soon broken by whites, which led to a series of Native rebellions from 1855 to 1858. Seattle and the Suquamish-Duwamish people had moved -- after the signing of the treaty -- to a reservation across Puget sound from the city later named after him, on the east shore of Bainbridge Island. Today -- its landbase diminishd as usual -- it is the Port Madison Suquamish Reservation. Part of the reason why the phoney kindly spirit of ecology version quickly became so much better known than the original "Funeral Oration" is that even during his lifetime, and for several decades afterwards, the white settlers of Seattle (WA) made Sealth, and later his daughter (whom they liked to call "Princess Angeline") into a kind of mascot that hid from their consciousness and consciences what they had done and were continuing to do to all the real Indian people of the area. The cynical, embittred and accusatory passages of Sealth's Funeral Oration do not fit the kindly Old Injun Mascot image these settlers -- and their descendants -- wished to project. That seems to be the psychological or EuroCultural dynamic behind the huge sales of the fake Jeffers children's book, too. The fraud was definitively exposed in 1985. Major Seattle newspapers editorialized about the fraud in connection with the city's productions of various forms of public adulation built around the fake version, in connection with the so-called "Discovery of America" quincntennial hoopla. In short,, Jeffers and the publishers knew or should have known at the time of its original publication -- 1991 -- that their book for children is based on a complete and deliberate fake of real and important Native history. In my book, this amounts to an educational fraud. Jeffers adds some decorative fakery too, besides the use of a different historical figure for her visual renderings of the alleged Seattle. 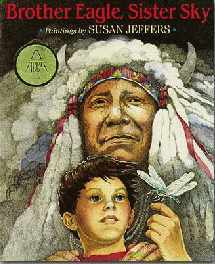 All the illustrations in Jeffers' book use clothing and artifacts from Plains Indians to illustrate this northwest coast speech (the fake version). In reviews in some Indian periodicals, this decoration-fraud has also been pointed out. Jeffers has defended herself in letters to editors that she had the book looked over for accuracy by some Lakota (Plains tribe) women she happens to know, who may have posed for some of the pix, and who also supposedly advised her that her children's book version of Sealth's speech was accuratw to "the Indian spirit.". This points up something white people can't seem to grasp: with 500 nations, having unique histories, languages, cultures, etc. being "Indian" is no a guarantee you know much about most of them except (perhaps) your own. No Plains Indian is any better an advisor on Northwest Coast history and customs than the research -- book-based and hard work -- he or she does about it (and that any writer proposing to write a book on Native history should do). Indian people from differrent tribes and areas have different histories, cultures, physical or bodily appearances, clothing, lifeways, and languages. They are not interchangeable. as stereotyed "Indians" or the recent tedious white PC phrase "Native Americans". (Not done yet, summarize as a chronology from Kaiser, add some of the Ted Peters self-defenses, Internet emails, etc. on the exposure of the fraud.) Maybe put the fraud creation chronology on another page. Native American BOOKS, text and graphics copyright Paula Giese, 1996. except -- as here -- where elsewhere attributed. CREDITS: Jeffers' cover scanned from the book. Two Moons photo appeared in vol. 6 (1911; Piegan, Cheyenne Arapaho) of Edward Curtis's lifetime 20-volume tribespeople - and - dying way of life salvage photography project. 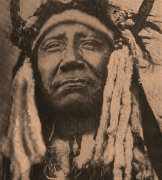 Chief Sealth photo from the Granger Collection. Bad book warrior icon excerpted and colored from John Kahiones Fadden, Mohawk artist, drawing, 1970, as explained on the section menu page credits.